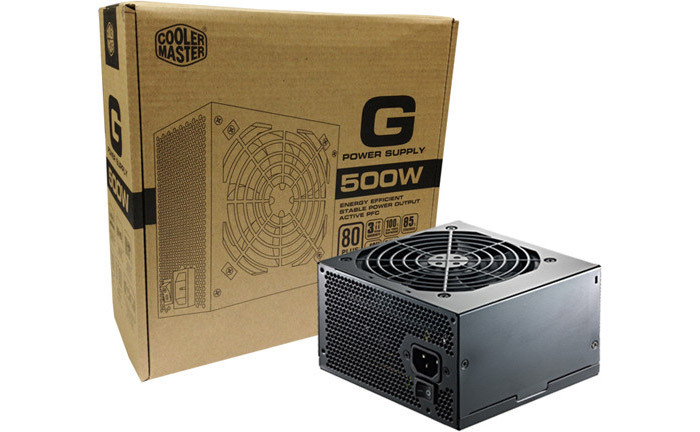 CoolerMaster has announced a new line of power supply units (PSUs) that goes under the letter G this time. As of now the new G-Series consists of three models with nominal power of 500W (G500), 600W (G600) and 700W (G700) and features high energy efficiency due to the integrated PFC and 80 Plus Bronze certification. The new CoolerMaster G-Series is fully compatible with the recently released Intel Haswell processors because of the single 12V rail topology with high DC output that goes up to 55A/660W for the G700 model. The new PSUs come with 120 mm cooling fans with intelligent control to help prevent PSU overheating and until 70 per cent loading the fans will work in silent mode. All kinds of protection such as undervoltage, overvoltage and others have been implemented too. The G-Series PSUs provide plenty of connectivity – nine SATA connectors (six for the G500/G600 models) and three Molex connectors with the G700 model providing multi graphic-card support. All models arrive in special packages made of recycled paper that show that CoolerMaster is concerned about the environment. The new G-Series will be available in early August. The estimated prices are as follows – G500 (EUR 59.95), G600 (EUR 69.95) and G700 (EUR 79.95).